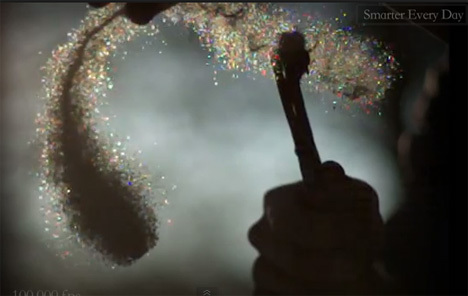 Sometimes, when artists and geeks come together some beautiful things can happen. That was exactly the case when the awesome dude from Smarter Every Day visited a glass blowing shop to explore the insane mystery of the Prince Rupert’s Drop. Not familiar with the term? Most people aren’t. It’s a glass object created when molten glass is dropped into a container of cold water. The resulting tadpole-shaped piece of glass is incredibly strong and won’t break even when struck with a hammer on the larger end. 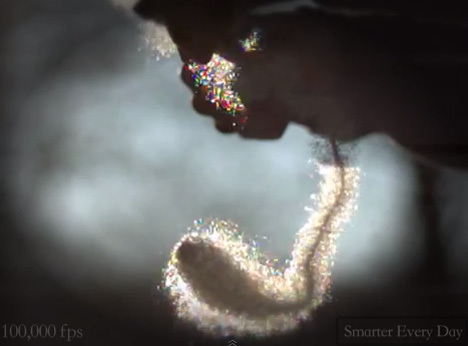 The video tells the story better than we ever could, so we’ll let Smarter Every Day explain the phenomenon, along with ultra-high-speed shots of the Prince Rupert’s Drops literally exploding into millions of pieces. See more in Earth & Nature or under Science. May, 2013.